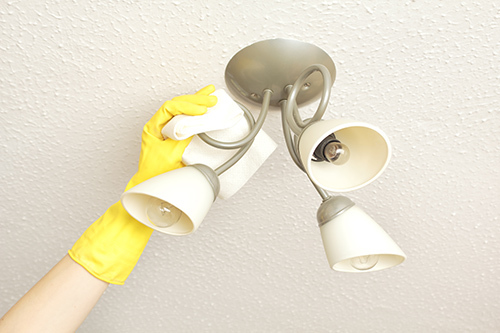 As the days get brighter, you’ll see dust and dirt that went unnoticed during winter. Luckily the long spring evenings are perfect for an extra bit of cleaning, and our top tips will help get you going. Before you get stuck into the dirty work, make sure you have all the cleaning supplies you will need to hand. Essentials include strong rubber gloves, cloths, sponges, brushes, bleach, all purpose cleaner, furniture and glass polish, bin bags and paper towels. View our article: Top 15 Products for Your Home Cleaning Kit for more help with preparing your spring cleaning kit. Always clean from the ceiling to the floor; first tidying, then dusting along the ceiling, light fixtures, pictures, etc., finally vacuuming and mopping the floor when everything else in the room is done. This just makes sense because the earlier jobs will of course dirty the floor. You may also find it makes your work seem that bit easier and more productive if you finish either the downstairs or the upstairs completely before starting the other. Wait for a cloudy day to wash your windows, as direct sunlight can dry windows too quickly leaving streaks behind. For more tips on cleaning windows go to our guide: How to Clean Windows. The best time to take on the task of cleaning your fridge and freezer is right before you do your grocery shopping, when the contents are at their lowest. Take everything out and dispose of any items that have passed their use-by date, and almost-empty items that you will never use. Look out for opened jars and bottles which state on the label that they should be used within a certain number of days after opening. Wipe down the interior of the fridge with a damp cloth and disinfectant. The same can be done for food cupboards if you think it's needed. Defrost your freezer and then wipe it down with disinfectant too.